Quick Response Code is a type of two-dimensional barcode that can be read using smartphones and dedicated QR reading devices, that link directly to text, emails, websites, phone numbers and more! You may have even got to this site by scanning a QR code! Soon enough you will see QR codes on product packaging, shop displays, printed and billboard advertisements as well as in emails and on websites. 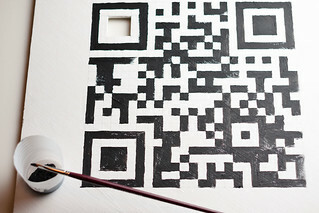 The scope of use for QR codes really is huge, particularly for the marketing and advertising of products, brands, services and anything else you can think of. In 1994, DENSO WAVE (then a division of DENSO CORPORATION) announced the release of its QR Code. The QR in the name stands for quick response, expressing the development concept for the code, whose focus was placed on high-speed reading. When it was announced, however, even Hara, one of the original developers of the code, could not be sure whether it would actually be accepted as a two-dimensional code to replace barcodes. As a result of his efforts, the QR Code was adopted by the auto industry for use in their electronic Kanban, and it contributed greatly to making their management work efficient for a wide range of tasks from production to shipping to the issuing of transaction slips.